Arsenal ended Manchester United's unbeaten run under interim boss Ole Gunnar Solskjaer after registering a thumping 2-0 win over the Red Devils on Sunday night. Granit Xhaka opened the scoring for the Gunners in the 12th minute after his 30-yard strike took United shot-stopper David de Gea by surprise. The Red Devils failed to make the most of their chances and were soon punished for it when a penalty was awarded to the hosts for a challenge on Alexandre Lacazette. Pierre-Emerick Aubameyang, who missed a penalty against Tottenham Hotspur last week, stepped up to atone for the infamous miss and promptly found the net to double Arsenal's lead in the second half. 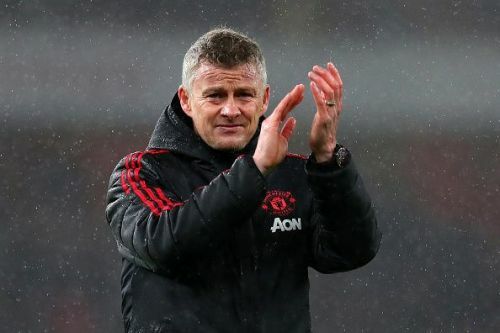 The win means that Solskjaer has lost his first Premier League game since he arrived to take charge of the team in December last year. The Norwegian manager had previously registered 10 wins and two draws before his trip to the Emirates on Sunday. Speaking after the game, the United boss said (via BBC), "We are disappointed with the result but looking at the performance, you cannot say it was a game we deserved to lose. We created five big chances, hit the woodwork twice." "When you see the boys work as hard as they do, the attitude they show in training - today we were lethargic in the first 10-15 minutes, did not have the zip and we did not take the chances. Hopefully we will be ready for Wolves in the FA Cup next week." The loss also allowed Arsenal to leapfrog United into the final Champions League spot, with the race for the top four heating up. I thought United were supposed to have improved under Solskjaer? Arsenal inflict Ole Gunnar Solskjaer’s first Premier League defeat as Man United manager. #ARSMUN Ole Gunnar Solskjaer suffered his first Premier League defeat since being appointed Manchester United's interim manager as Arsenal leapfrogged their opponents to move into the top four. Ole Gunnar Solskjaer says his team's loss to Arsenal is the 'lowest' they've been.